PODCAST 323: GET YOUR LAUGH ON! In this podcast we are interupted by a mysterious evil, and to combat this attack we debut our newest compilation! 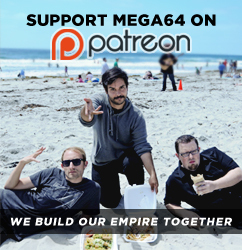 Mega64: Time is Running Out! And for the first time ever we put it up on Pre- Order! Which you can get right now. We also talk about Ebola, Shadows of Mordor, and collecting comics. Check it out! Click here for the audio version! Finaly, it's almost time for Gamedays! It's still not too late to get your tickets for our first day event, and to get discounted tickets to Disneyland for the day after. Click here for more details!